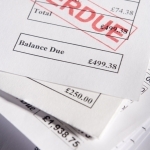 A study of bankruptcy filings in the United States showed that 66.5% were due, at least in part, to medical expenses. The study shows that about 530,000 families each year are financially ruined by medical bills and sicknesses. Researchers surveyed a random sample of 910 Americans who filed for personal bankruptcy between 2013 and 2016. They found that medical bills made up 58.5% of bankruptcies, and illness-related income losses contributed to 44.3%, with many saying both were their causes of bankruptcy.